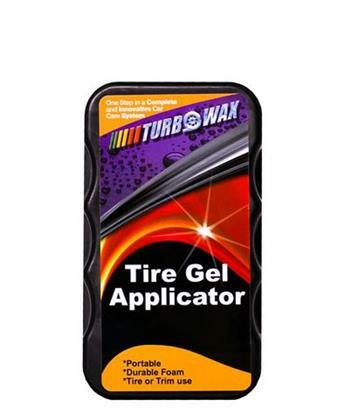 Turbo Wax Tire Gel Dressing Applicator Portable and resealable design makes shining your tires easy, clean and convenient. Saves your hands from harmful chemicals. NO MESS! works great with any type of tire. It even cleans the hard to get to side tread on mud terrain tires. Use it on your cycle, your hot rod, your SUV, your off road vehicle; the possibilities are endless! Fully self contained unit provides a TRUE NO MESS storage. Our foam outlasts all others! It covers all surfaces smooth and easy. Guaranteed!